At Impact Trophies & Medals, we have a fantastic range of embossed medals suited to any darts competition or team presentation. Our extensive range includes gold, silver and bronze embossed medals with dart board and dart player designs. Impact Trophies & Medals are a leading retailer of embossed darts medals. Great for personalisation, many of our embossed medals can be personalised with optional self adhesive text labels for the back of each medal, as well as optional coloured and patterned medal ribbons for displaying your darts medals. This attractive medal has been forged from a superior grade of brass, allowing for a greater definition in the embossed image. 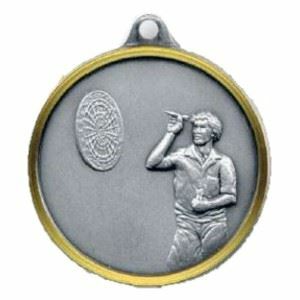 Available in a choice of colours and sizes, the medal features a highly detailed depiction of a male figure next to a darts board, preparing to throw a dart. The Darts Brass Medal is part of the bulk purchase range and can be purchased in quantities of 100 or more, offering excellent value for money. This contemporary large medal features a darts player figure taking aim with his dart. The darts player and the frame are polished in an antique gold, silver or bronze colour and the patch of backdrop is in black. The Cone Frame Darts Medal is offered with a minimum order quantity of 25 medals. 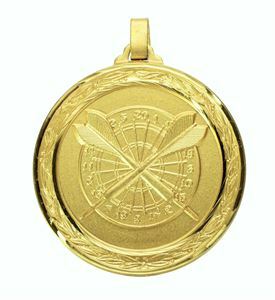 The Circular Frame Darts Medal is offered with a minimum order quantity of 25 medals. This large medal is finished in an antique bronze lacquer and features an embossed image with fine detailing of a darts player taking aim with his dart. The darts image is die cast and framed in a circular surround. 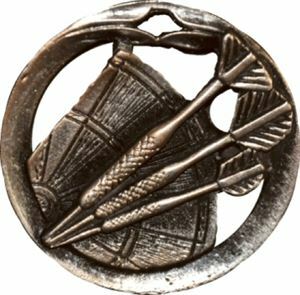 This large antique bronze coloured medal is die cast and shows three embossed darts with part of the dart board in the background, all framed in a circular surround. Please note that the Circular Frame Darts Board Medal is offered with a minimum order quantity of 25 medals. 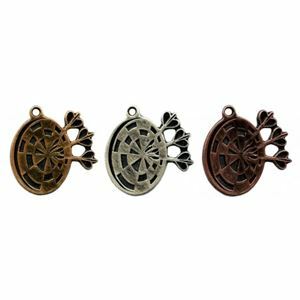 The High Relief Three Darts Medal is a brilliant bronze metal medal available in a choice of 2 sizes. The High Relief Three Darts Medal is an embossed medal with 3 darts within a laurel frame. The darts medal comes in gold, silver and bronze coloured finishes and has a loop at the top to allow for a clip on medal ribbon. The High Relief Darts Board Medal is a stunning and intricately detailed embossed darts medal. 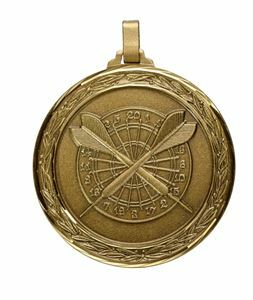 The medal is available in a choice of gold, silver and bronze finishes and comes in 56mm diameter size. The face of the medal is embossed with a delicately detailed darts board with a laurel branch surround. The High Relief Darts Board Medal has a loop at the top of the medal, making it compatible with a huge selection of clip on medal ribbons. 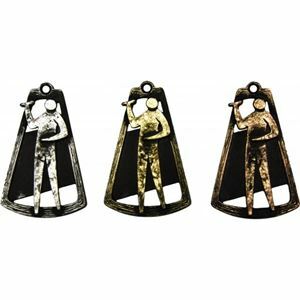 Made from bronze for a high quality, heavyweight feel, the High Relief Male Darts Medal is a stunning embossed darts medal great for any competition or event. 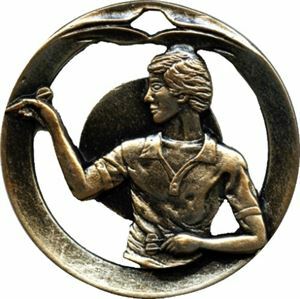 The medal is embossed with a partial dart board on one side and a male darts player on the other. The back of the medal is smooth for the addition of an optional printed text label and the top of the medal has a loop to allow for the addition of a clip on medal ribbon. The High Relief Dart Medal is a premium darts medal with a smooth matt style design. The medal measures 56mm in diameter and features a darts board with a hand removing a dart. The High Relief Dart Medal is available in gold, silver and bronze coloured finishes and has a built in loop at the top of the medal, ensuring easy attachment of your choice of clip on medal ribbon. The Faceted Darts Medal displays an intricately embossed dart board and two darts. The medal is made from brass and is diamond faceted which gives the medal a superior quality finish and a weightier feel. The 60mm medal has a embossed laurel leaf border.